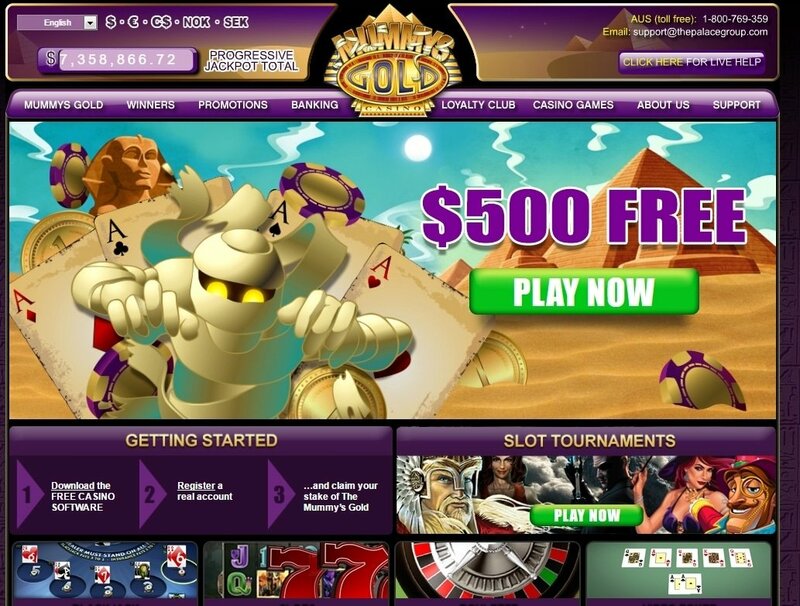 In 2002, Palace Group of Casinos launched Mummy’s Gold Casino. The online casino has rich graphics that transports players to the golden sands of the Pharaohs. All of its games are powered by Microgaming. The casino offers classic table games and slots for the gambling aficionado. Lady Luck may bestow her fortune on the banks of the Nile when playing in the Mummy's Gold Casino. When players first register at Mummy’s Gold Casino, they will get a welcome bonus that will match 100% of their first deposit up to $500. There is a playthrough required that is 50X the bonus. Players must claim their welcome bonus within 7 days of opening their account. They will also have up to two months to finish their playthrough. Table games and slots count 100%. Other games count a little less. Twenty dollars is the minimum deposit. The casino likes to appreciate and recognize their loyal patrons. Starting the first day of registration, players become members of the casino’s loyalty club. There are 6 tiers in which a player can advance. They go from Blue to Prive. Registration starts out with a free 500 loyalty points and the players keep advancing. The games that earn points the quickest are American roulette, table games, and the slots. Players get one point for every €10 wagered. The other games have rates that are a little lower. Each month, the casino has selected games where players can double or triple their points. Each loyalty tier has rewards that are larger. While all patrons get tournament invitations, extra bonuses, and promotions, there are even more benefits at higher levels. One of the benefits of the higher levels is members having their own account manager. They also get special gifts, bonuses, and private invitations. The top two tiers have invitations to top sporting events. These members also enjoy faster withdrawals on their funds. The casino sends out a monthly newsletter to inform players about the newest promotions. There is also information about cash prizes and other news about Mummy’s Gold. There are also a lot of promotions at Mummy’s Gold Casino. They have a perpetual calendar of promotions and prizes for members. One of the members’ favorite promotion is the bonus for referring new players. Special tournaments are also available. Players can cash in their loyal points for playing bonuses and special prizes. Lucky players who win a mega progressive jackpot prize will also be congratulated with a $1000 bonus from the casino. Mummy’s Gold Casino has a license from the Malta Gaming Authority. It as is eCogra certified for the trust and security of its patrons’ financial transactions. All of the games in Mummy’s Casino are powered by software from the renowned Microgaming. They are a trusted name in gaming technology. Microgaming powers some of the top online casinos in the world. The casino is constantly updating their software. These games have superior graphics, animation and sound that players would expect from a top online casino. Players have three different choices for accessing Mummy’s Gold games. They can simply download the casino software and play on their computer. It only takes a few minutes and the player will be ready to start the games. Some players may choose to use their browser and play the games on flash version. No downloading is necessary with this option. Players who want the convenience of wagering on the go can download select games on their smartphones or other mobile gadgets. When players download the casino software to their computer, they can choose from nearly 250 games. Mummy’s Gold is always adding new games and often give their patrons early access to try them. Players can go the user-friendly lobby to see each game listed by category. By just the click of a mouse over the game, players will get a brief description and how the game is played. Those who just want to test the games for free can open a guest account. The casino gives guests 2000 credits just to see how they like playing different games. These credits are like play money. Slot enthusiasts are in for a treat when they play at Mummy’s Gold Casino. They have a choice of over 100 different slots. The games are multiple reels and progressive jackpot style. Those who prefer the traditional Vegas fruit and gems also have plenty of choices. Video slots feature animated slots with interactive characters. Players can play several slots at once with the mega spin feature. Since this casino has an ancient Egyptian flare, there are several slots that share the theme, such as Cleopatra’s Nile and Pharaoh’s Tomb. There are shared jackpots where players can win thousands and even millions of dollars. Mummy’s Gold Casino offers a large variety of classic table games. There are several favorite styles of blackjack, Vegas Strip to European style. Roulette enthusiasts have three different kinds to play. There is even a progressive jackpot called Roulette Royale that many players enjoy. Not only does the casino have table games and slots, but they also offer keno, scratch cards, and video poker. Regardless of the size player accounts, there are games for just about any choice or budget. Players can play with confidence knowing that Mummy’s Gold Casino is an e-Cogra casino. They ensure that player’s personal and banking information is totally protected by high-tech digital encryption. There are several banking methods available for deposits and withdrawals. This makes banking convenient for casino members. All transactions through the casino are private and secure. With the seal of approval from e-Cogra, players also know that they have a guaranteed fair play to win with any game. Players are welcome to check the e-Cogra website for more information. All registered players in Mummy’s Gold Casino have access to customer care representatives 24/7. The friendly and knowledgeable staff supports 10 different languages. Help staff can also explants additional opportunities for bonuses and promotions and the different loyalty tiers. Customer service can be reached by live chat, email, fax, or toll-free phone.